The feeling of being in a swinging chair is impressive. It is a relaxing way to end your evenings after work or just relaxing beside your pool or in the sunshine. Here are the ten swings that will prove chairs are overrated. They are shaped to suit your body shape and provide relief to your body muscles. The design will make it very appealing both indoors and outdoors. The Kouboo swing chair is made from natural, eco-friendly rattan material. The hemp hanging rope is strong to handle the different weight. The size (29cm by 30cm by 47 cm) is right for one person for the best comfort. The design of the chair resembles a massage chair. It’s also appealing in your indoor area. This modern patio hanging pod is like a dream. It’s quite large so it doesn’t come with a stand. It’s meant to be hung from a patio or strong tree cause it would be hard to find a stand that could support the chair with someone sitting in it. But even on the ground, this piece of furniture looks great and it offers a cozy spot to curl up with a good book. It is made from synthetic UV resistant rattan which is best suited to any weather and perfect for outdoor use. This means it can last for long outdoors without degrading. The coated aluminum frame provides the strength to handle the weight. Strictly speaking, no one is excluded from using this hanging pod. It also comes with three pillows and a soft cushion inside. What is impressive about this piece of furniture is the design. It is shaped like a teardrop and you will find it very appealing especially when it is hanged indoors or outdoors. It works well in complementing your house décor with its black and silver aluminium frame colors. Expensive, but you should consider the quality of the materials used. It features cotton chords that are soft and thickly spun by the artisans. 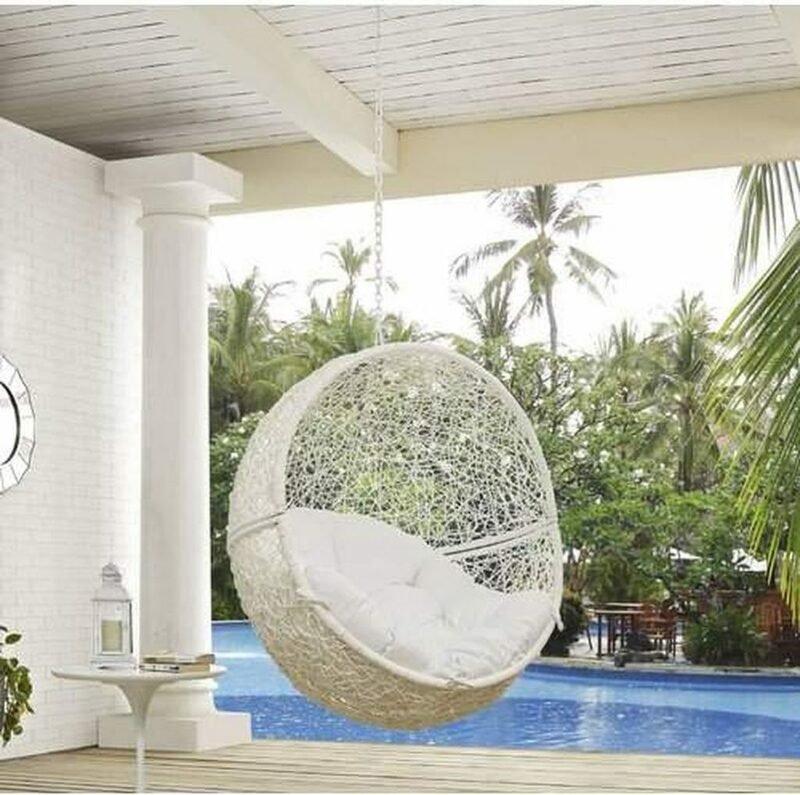 This hanging chair is suitable for those who like relaxing in the balcony while reading a book or socializing with a friend on the terraces. It can support weights of up to 175 pounds. The size of the chair (61cm by 40cm by 38cm) is right for one person for comfort. For those of you who seek for a modern variation of an old papasan chair, this is the perfect wing chair for you. Its round shape and thick cushion make it appealing in the background. Its round aluminum frame is connected to a sturdy chain that suspends it. You don’t have to worry about the ability of the whole structure to handle different weights. 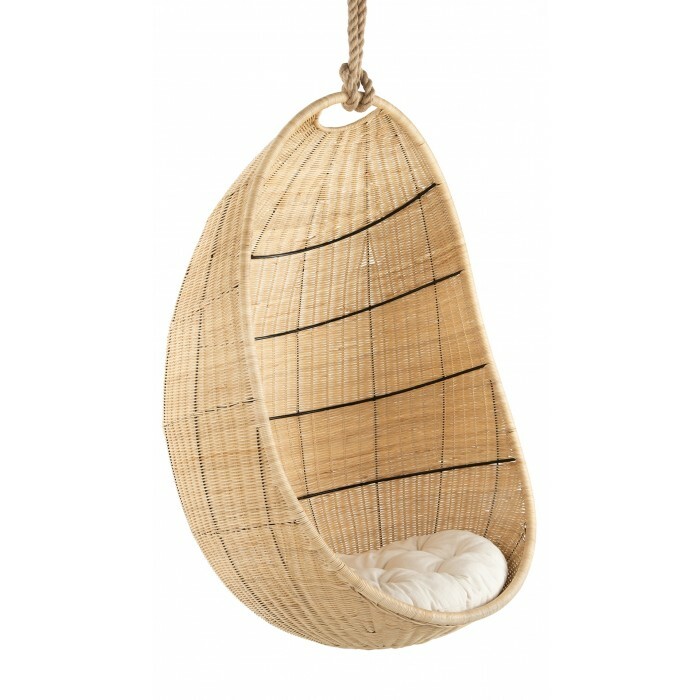 If you love swing chairs that are made from natural materials, then you should settle for this cocoon wicker swing. It is made from a natural substance known as rattan. This material is eco-friendly made of a naturally renewable palm that has multiple uses, such as for furniture, craftsmanships and building material. It is strong enough to handle your weight even while swinging. For added comfort, the swing chair comes with a soft white cushion. 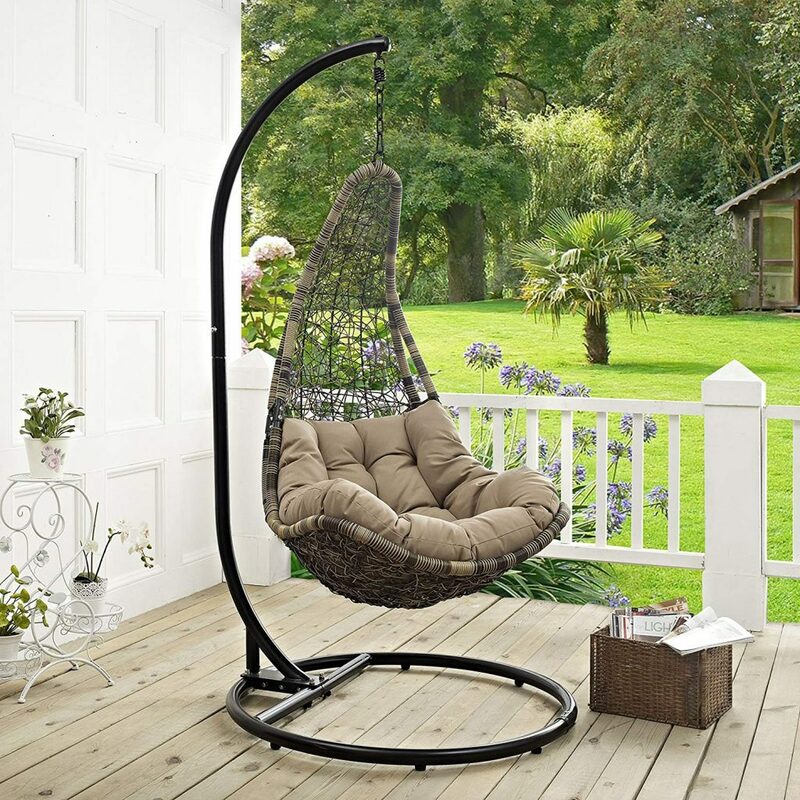 The swing chair also comes with a 6-meter hemp rope that suspends the swing chair to your desired height. No hanging hardware is provided by the manufacturer. The dimensions of this swing chair are 52 inches high, 28 inches in depth and 33 inches in width. You also get to enjoy sipping a glass of wine in the evenings while having a good time in the cocoon swing chair. Delivery is free up to the entrance point of your building. These stylish hammock swing chairs are made in America from natural oak tree timber. This material is bent into shape after steaming it. The hanging ropes are made from blended cotton and poly material. The chair also features the stainless steel rings. These chairs come in three types to choose from. It comes with a head pillow, and you can freely select the cushion. The cushion is either made from natural cotton and polyester, which is available in green color. This chair can be used both indoors and outdoors. One unique feature is its ability to adjust both the recline and the height of the chair. This gives you the best comfort you can think ever think of. You can also opt for a chair with a foothold for added support. It comes with the necessary instructions manual which is easy to understand when setting it up. The material can be degraded by weather outdoors. The Modway lounge swing chair provides you with a supportive place to rest. The steel frame is powder coated to avoid rust from forming as well. The inside is woven using the synthetic rattan material for an excellent inside look. You can place this hanging chair anywhere as it comes with a stand and the cushion materials are fade and water resistant. This cover is also removable if you want to machine wash it. The design is what makes it unique and a must have. Its teardrop design makes it a good swing to have beside your swimming pool or garden. It comes with a steel frame support that makes it easy to move it to any part of your house whether you are indoors or outdoors. This unique swinging chair is like an elegant and, inviting birdcage with stand. 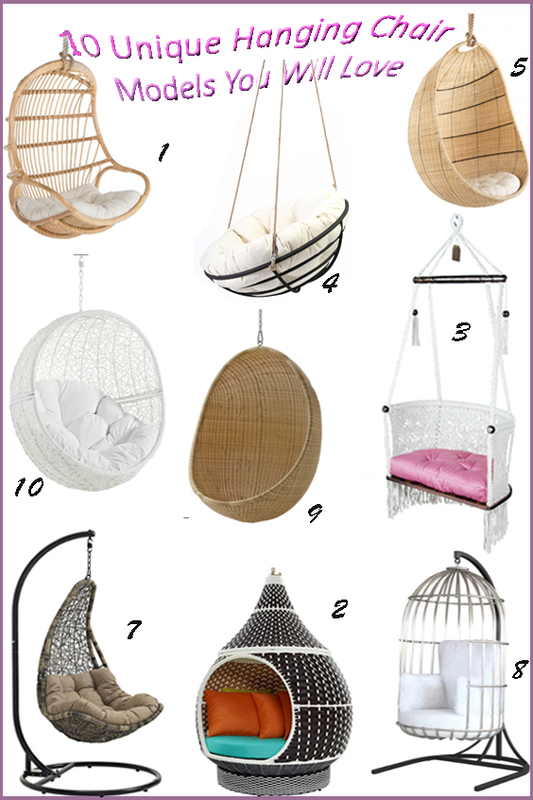 The pillow-filled hanging chair looks just like a human-sized birdcage with a large opening in the front. It features a white cushion that will give you maximum comfort. 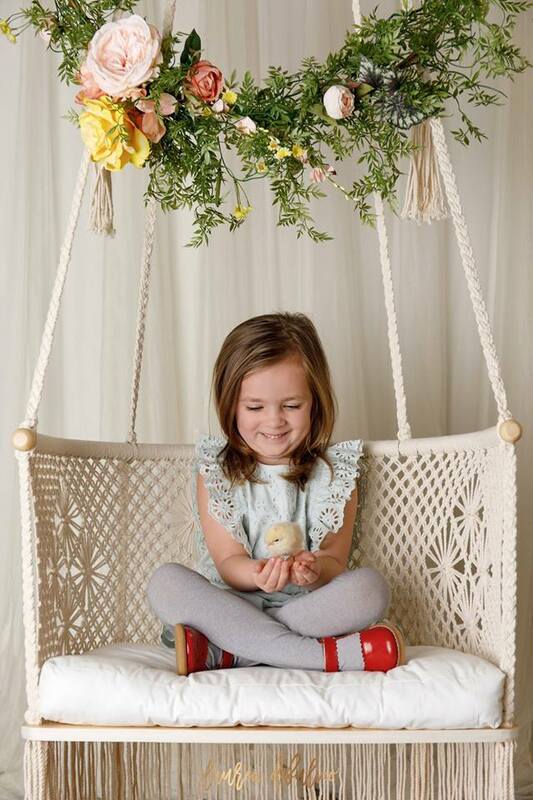 Just hop into the bird swing chair and sink into the cushion. This is an excellent way to relax. Although no one wants to be put into a cage, a bird-cage-chair can provide a sense of protection and playfulness. This version is inspired by Dutch design studio Ontwerpduo. The original hanging cage chair hangs from the ceiling and swings gently creating a soothing excitement. This shape is inspiring, unique and will improve the interior appearance of your room. It can only be used indoors which means that the vagaries of weather won’t be able to damage the materials. This will make it long lasting. The weight capacity is 375 pounds, and this makes it suitable for only one person. The outer cage structure and the stand are made from stainless steel. This material is built to last long. You can move it to any location in the garden or inside the house and relax in it. 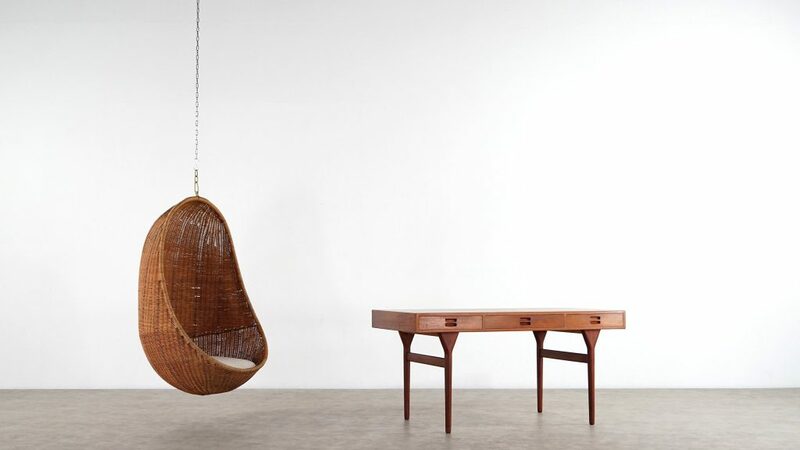 This iconic hanging egg chair was designed in 1957 and is known for its timeless design portrayed by soft female rhythm and the strong rattan material. This unique design is attributed to Danish furniture designer Nanna Ditzel. It comes with a soft removable cushion for comfort and it is made from natural rattan material and blends well with both the outdoor and indoor environment due to its brown color. The basket shape appears oval and can sit only one person. The hanging rope is sturdy to support your weight. You don’t need to worry about its safety. You can also purchase the stand separately and the shipping is free. It is suitable for relaxing in the balcony or beside your swimming pool while reading a book in the evenings. No single creation expressed this spirit more than her Hanging Egg Chair, designed 1957, which was often featured in interior and fashion magazines. Suspended by a chain from the ceiling, this no-gravity chair suggested a liberated lifestyle, free from earthbound fears. The design of this swing chair is eye-catching. It comes with or without stand, is round shaped and curved inwards to accommodate one person comfortably. There is some soft cushion inside. The whole structure is crafted from synthetic rattan material, which is best suited for outdoor use. But this chair combines function, fashion, and fun, and will look great also inside every home. The white color creates harmony with your indoor or outdoor background and makes it the focal point of every space. The description above will help you choose one of the best swinging chairs. 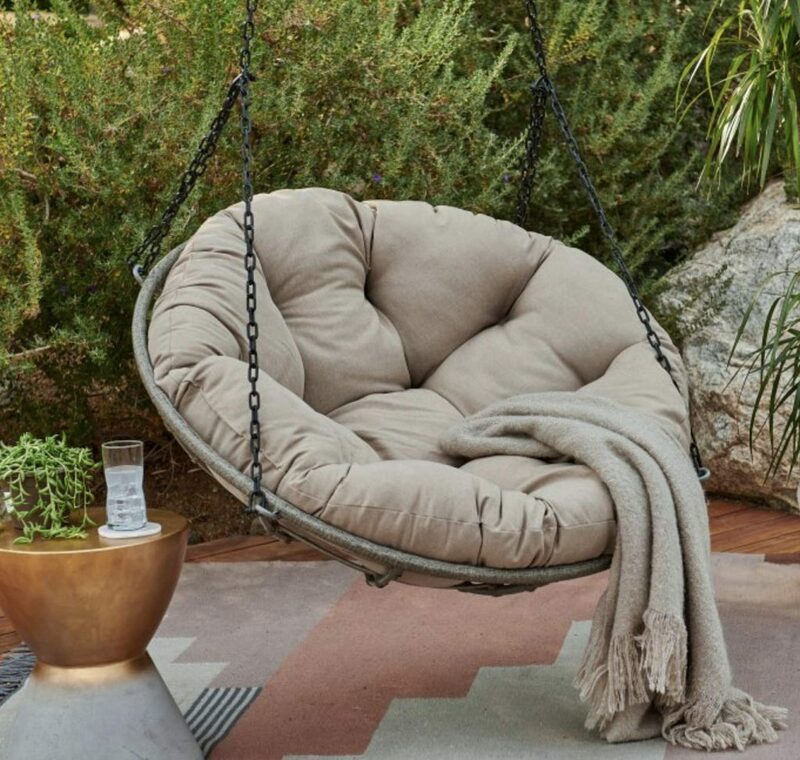 They provide a good way to relax after work in the evenings or maybe during the weekends., A good hanging swing chair should be comfortable and good for the back, with soft inside cushions to reduce pressure points in your body. So the design matters a lot, as it provides support and comfort to your back area. No doubt, a hanging chair is not only a piece of furniture to sitting in. It is an innovative chair designed to compliment an easy-going lifestyle and will make every room special. But did you know that hanging chairs can relieve pain and stress? These chairs mould to your body shape and weight; in the process, they reduce the pressure points. The muscles relax and blood flows freely to any part of your body. You can purchase one today to take advantage of this health benefit.